For Heidi Steiner, a good, healthy dose of playing is all part of a day’s work. There’s no problem connecting with the inner child here—she is ever-present, as is clear by the surrounding collection of bears in antique lace and satin dresses, cats with birdcages on their heads, honey bears that double as purses, delicate elephants, and study rats. "There’s still that little girl in me and shes still playing, Heidi says with a laugh. "I really do love what I do. Every day is an adventure." Heidi refers to her chock-full studio/workshop as "Heidiland," and its a place where anything seems possible and everything is fun. You might find a Santa bear riding an antique childrens scooter. Or bear angels with quilted wings hovering overhead. Or a group of minis decked out a la The Wizard of Oz and nestled atop a top hat. Hopefully, the ideas come from my soul,"Heidi says. “Sometimes, when Im working late at night, watching old soupy movies on TV, I’ll think, Oh! What if I can’t think of anything new? But, usually, a project I’m working on spurs a multitude of others. And then the ideas seem limitless." The range of Heidis ideas is astounding—especially considering she came to bear making through something of a fluke. Always interested in crafts, she developed a passion for quilting in the late 1970s. By 1983, the quilting, coupled wit Heidis and he husband’s passion for antiques, prompted her to try creating old-fashioned dolls dressed in antique clothes. 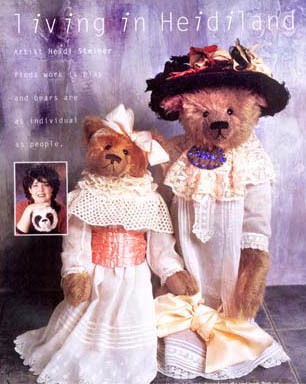 One day in the mid-1980s, one of Heidis doll customers asked if she ever made teddy bears. "I said, I could sew you a meatloaf better than cooking you one," Heidi recalls. "So I gave it a try. And I was immediately hooked, really smitten." Because she had rarely used patterns in her other sewing, Heidi simply plunged in and embraced the challenge. The approach forced her into the design aspect of bear making and also allowed her tremendous creative freedom. Right from the start, Heidi pursued a whimsical, old-fashioned look and feel. "I wanted them to look well loved," she explains. "Not that I do a lot of distressing. But I try for that flavor of a long time ago." Through the years, her bears evolved from simply cute to something more. "Now they have a genuine sweetness," the artist says. "They seem to have their own little souls. What I hear from shop owners is, You just cant help but love them immediately."
As Heidi became more proficient with her bears, the ideas began to fly fast and furiously. The desire to diversify led to her attempts with other animals, including her well-loved rats. "I wanted something to go with the cats," she explains, "and rats just seemed so much cooler than mice." Eventually, Heidi recognized the need to have at least one big studio piece to attract attention and set her apart. Thats how her elephants developed three years ago. She was heading for the International Toy Fair in New York City and wanted something to stop people in their tracks. "I thought they would be really fun," she explains. "I displayed them with peanuts on the ground." 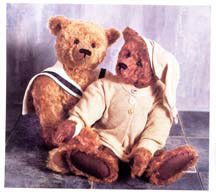 Putting bears into vintage children clothing seemed simply a logical next step. "For the past 20 years, my husband and I have been very involved in collecting antiques. We have flea markets in our area, and we visit antique marts and shops when we travel. I’ve collected and hoarded things over the years." Collecting antique toys, many of which had hidden elements or secret compartments, prompted Heidi to develop her bear candy containers. "Theyre something a little different, geared toward the advanced collector," she explains. Her bear purses, by contrast, are a self-proclaimed fluke. "I did one for myself because I was going to a show," she says. "When I got there, everybody was pulling and tugging at me to see it. People really do use them, and I’m glad to see that." The appreciation factor is important to Heidi. She finds she’s able to part with her creations largely because she knows they are going to good homes. She often receives letters from collectors whove adopted her creations and loves that initial gasp of wonderment her creations inspire. "Its a reaction of Oh, God! I love this!ְ" she says. "Everything I do is made to order. People sometimes dont understand that I’m a one-woman operation. But the really nice part of an artist-made item is that each one is just a little different. They take on their own little personalities." While it’s true that each of her creations is unique and her one-of-a-kind pieces are the most elaborate and satisfying, Heidi does do limited editions of varying sizes. In fact, during the past few years, she’s begun doing what she calls open editions, going back to past designs. "I just feel terrible telling people they cant have something," she explains. For her small rats, Heidi uses upholstery velvet. Larger ones are made from leather and mohair. For all of her bears and the majority of her animals, she relies on mohair, dying the fabric when she can’t find the color she wants. "I love to dye fabric,” she says, “but I don’t do it a whole lot because you can’t duplicate the colors." Stuffing, which tends toward the firm side, runs the gamut from excelsior to polyfill and pellets. "I love it when you pick up a bear and know youre holding something,” she says. “And the pellets make a really cool sound when you vacuum them up." Eyes are made from glass or antique buttons, although Heidi finds the latter too small for her larger bears. She does use a machine for seams on her larger pieces but notes that, even then, there is considerable hand work necessary. Crafting the face is the most satisfying part of the process for Heidi; she feels that’s when the bear’s personality begins to shine through. Cleaning seams, by contrast, is the most tedious and least attractive portion of construction. "Some of the furs are so difficult that sometimes you feel you’re really manhandling the poor guy," she explains. "If all is right in Heidiland," Heidi can finish a bear in a couple of days. Usually, however, she works on five or more at a time, a practice that adds diversity to her work and gives Heidi a sense of working on an entire family. "I probably do 500 to 600 animals a year," she estimates. "I’m so addicted to it. I do it seven days a week, around the clock." Heidi cheerfully admits that one of the things that first attracted her to doll and bear making was the chance to be an at-home mom. Her daughter, now 20, delighted her when she asked for a bear to take to college with her. Her 18-year-old son, meanwhile, has proven a continual source of inspiration. Comic books are his passion. So, for the past six Christmases, Heidi has made him a bear based on a comic book hero. Crafting such specialized creations is what she cherishes the most. “I love it when somebody throws an idea at me or a customer makes a special request,” Heidi says. “When a new idea hits you and you get that ‘got to drop everything’ feeling—that’s the tops. “I’ll be really happy in five years," she continues, "if things are like they are today. I’m such an optimist. I always see the glass half full. Hopefully, people will still be interested in my bears and there will still be a need for them." After a moment, she laughs and adds, "If not, I’ll still be doing them—I’ll just be needing a big storage bin!" Sounds as though that little girl is alive and well—and playing to her heart’s content.